These objections and reasons are not as like they thinking I have my bank statement and transactions including Rs. 4 lac balance I have transactions of my salary in statement and my husband recently employed he is also have his salary transaction in the same statement because we are both using our joint account. I just want to go to the UK and meet my family for 4 weeks and I am with my 6 year old daughter. My husband is not going with us due to his job. Now please guide me; should I go for an Administration review and provide them my bank statement because my visa was rejected on 26 July 2016 I still have time period for administration review OR should I reapply immediately to remove all these objections and give them more evidences I mean bank statements and our pay slips etc? Kindly guide me what to do which way will work. Your quick help and guidelines will help me. Actually My solicitor wants to take administrative review he said everything is okay we just need to show bank statement with administrative review where is clearly salary transactions we dont need to reapply , I am not getting satisfied whatever administrative review will work or not I need your suggestions because you wrote that visitor cant take administrative review but my solicitor going to do this I am confused. A 'lawyer' offers to provide representation in an Appeal or an Administrative Review. His representation may or may not attract a fee in the opening gambit. You Google for 'Administrative Review' and see that it's a real thing. A few weeks later the lawyer tells you there's great news! Your case was reviewed and will be handed over to the Tribunal for a decision, but his representation will attract a fee. You pay. A few weeks later the lawyer tells you there's great news! Your case was heard at the Tribunal and will be brought before the Upper Tribunal, but his representation will attract a fee. You pay. And so on until the lawyer tells you that a fresh application is needed, and his representation will attract a fee, blah blah blah. Each step is supported by correspondence and paperwork from the 'Home Office'. But... It's all fake. The Standard Visitor Visa has no rights of appeal or administrative review. Administrative Review has to do with other kinds of visa applications, stuff like work permits and entrepreneur visas. So it's a scam. Somebody can say, "HEY, the lawyer is innocent, he just doesn't know how things work"; that's tantamount to a scam anyway. 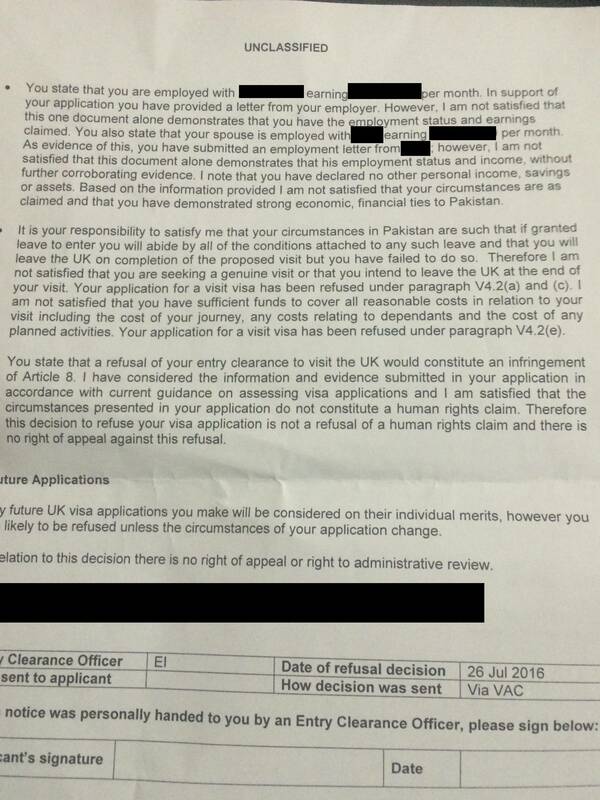 You'll be told in your application refusal letter if you can ask for the decision on your visa application to be reviewed. This is known as an 'administrative review'. On the plus side, you may not actually have a refusal, it depends upon where the scam took root. Initiate a "Subject Access Request" to get your file and see what the 'official' records say about you. When your SAR comes back, arrange a consultation with a member of the UK Law Society, use the lookup tool on ILPA. Therefore you should not attempt administrative review, as it is not available. Any solicitor telling you that is their plan should be dropped immediately, as they are clearly incompetent and incapable of reading plain English at best. Standard Visitor Visa - note that this is the visa you should be using for a 4 week visit. Family visas are for those looking to stay more than 6 months. Visitor Guidance - help from the UK govt on applying for a visitor visa. ... you are likely to be refused unless the circumstances of your application change. This implies that the problem with your application (from the point of view of the people deciding to award you a visa) is your personal situation, and not the evidence (or lack thereof) that you have provided. You can apply again with better evidence, but unless your existing evidence is misleading in some way, the ECO thinks you will be refused again. Not the answer you're looking for? Browse other questions tagged standard-visitor-visas pakistani-citizens family scams or ask your own question. Visitor visa refusal. What are the chances of reapplying?